Long Beach, Calif. – November 1, 2017 – Formula DRIFT has announced that ITW Global Brands has extended their support of the Series with Title Sponsor Black Magic and Official Sponsor Gumout for 2018 and 2019 season. Formula DRIFT also announced the addition of ITW Global Brands, Permatex and Fast Orange as Official Sponsors for the 2018 Pro Championship. Additionally, Formula DRIFT announced that it has entered into an exclusive relationship with two tire manufacturers, Achilles Radial and Nexen Tire, who will serve as the Official Tire Suppliers of Formula DRIFT PRO 2 Championship. The partnership will help with team cost containment, company inventory management and competition parity. These steps will help continue to serve the development of the next generation of PRO drivers. Formula DRIFT has announced the provisional schedule for the 2018 Championship Season. Notable changes include moving the final round of the season, which was previously Irwindale Speedway (now closed), to Las Vegas. Additionally, St. Louis and Montreal are in contention for venue prospects for the July event. Long Beach, Calif. – December 22, 2015 – Formula DRIFT will begin the 2016 World Championship season beginning with Round 1: Streets of Long Beach on April 10-11. Tickets are now on-sale and can be purchased online via the Formula DRIFT website, www.formuladrift.com. The World Championship will consist of a total of nine rounds of competition including eight Pro Championship rounds in the United States and Canada and two additional rounds of competition in Japan. Round 1: Streets of Long Beach marks the beginning of the season with Fredric Aasbo returning to defend his championship. Reserved seat tickets are available online for purchase with the option to select from any of the available grandstands. VIP experiences are also available for purchase including reserved seating in Grandstand 18, a track walk during opening ceremonies and more. Tickets are now available for Round 1: Streets of Long Beach on April 10-11, including reserved seating, 2-day ticket packages, and VIP tickets and can be purchased through www.formuladrift.com, Ticketmaster outlets, and the Long Beach Convention Center box office. Ticket prices start at $40 for grandstand seating with all seats reserved for Saturday’s competition day. 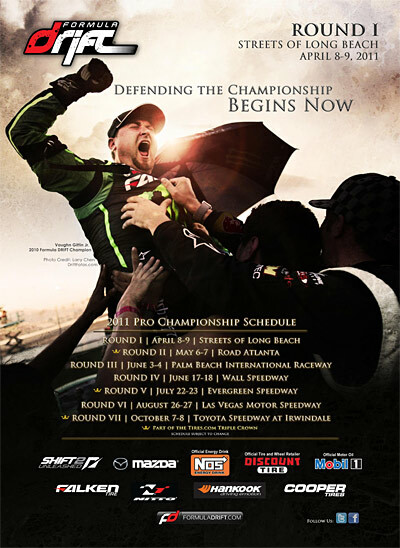 Long Beach, Calif. – January 20, 2011 – Formula DRIFT has announced the official 2011 Pro Championship Schedule of Events. Palm Beach International Raceway has been added to the list of venues and will host Round 3 on June 3-4, 2011. For the first time in several seasons Formula DRIFT has added a new venue and will visit South Florida at Palm Beach International Raceway in West Palm Beach. The newly remodeled facility features multiple state of the art tracks. Formula DRIFT will utilize the road course to create a unique drifting course that is to Formula DRIFT standards.